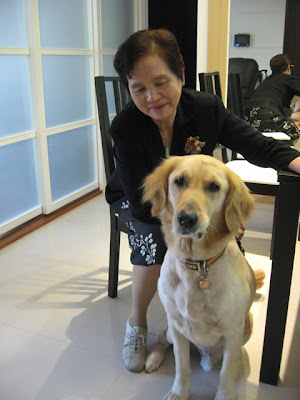 Grandma went back to Singapore on Saturday after spending two months with us in Taipei. After packing her luggage, she sat down to put on her shoes, I quickly sat very close to her cause I know she was going to leave us and that made her cry. One last scratchie before she leaves. I can't tell you how sad I am feeling. 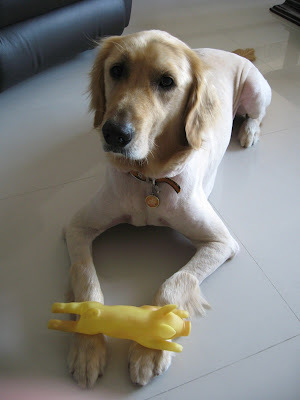 This squeaky pig was a present from Grandma, I will always think of her when I play with it. Grandma, thank you so much for taking such good care of me, Mommy, Daddy and Ashley while you were here. We miss you already and please don't take too long to visit us again! We love you!!! Oh Dino! 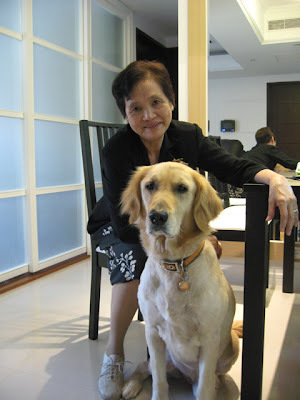 I´m so sorry for you that your Grandma is back to Singapore! I hope her does not take too long to visit you. She sure will gonna miss you so much too. We bet you miss your grandma already! So sorry to hear that! Oh, hurry back Dino's grandma. They all miss you. Awwww, Dino... You look so sad! I'm so sorry your Grandma had to leave! She sure looks nice, and I can tell how very much she loves you. I'll bet she's missing YOU right now, too! Maybe she'll come back real soon! 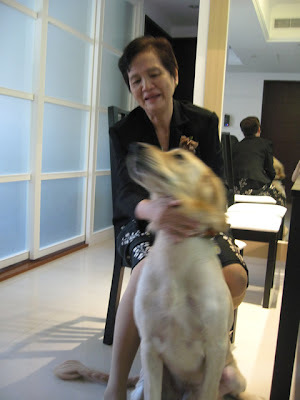 Dino, you are lucky to have a grandma who loves you so much. I am sure she will visit you again soon. I am sure you miss her and she misses you all too! I hope she comes back soon! I´m sure your grandma will miss you too! No worries, I'm sure you will get to meet grandma again soon!